The final debt ceiling legislation passed by Congress and signed by the President included $17 billion to help maintain the current maximum Pell grant of $5,550 through 2013. Unfortunately, to pay for Pell, negotiators eliminated subsidies for federally-backed student loans for graduate students. Pell grants, which have failed to keep pace with the rising cost of college despite recent award increases, are still vulnerable. A state Supreme Court judge signed a temporary restraining order blocking the $300 tuition increase passed by the Executive Committee of the CUNY Board of trustees "unless and until the Board of Trustees as a whole meets and takes action in accordance with the law." On Wednesday, June 29 the City Council passed a budget that fell short of restoring necessary funding for CUNY community colleges and student aid. Thanks to PSC’s advocacy, the Council added $25.25 million to the Mayor’s proposed allocation for CUNY community college operating support. The restoration will help, but it won't do enough to offset recent state cuts or defray CUNY's rising mandatory expenses. The PSC won a total of eight prizes, including first places in its class for best reporting, best editorial and best website in this year’s annual journalism contest sponsored by Metro New York Labor Communication Council. Clarion Associate Editor John Tarleton won first place for best reporting for his coverage of a building renovation project (“City Tech Renovation Goes Awry”) that endangered the health of hundreds of faculty, staff and students at the school. Tarleton (holding the award) is in the accompanying picture with chapter chair Bob Cermele. Scott Dexter re the policy: "A fake solution to a real problem"
On Monday, June 27, the CUNY Board of Trustees voted to overhaul general education requirements across CUNY’s 23 campuses to create a new transfer policy. PSC joined the University Faculty Senate in opposing the measure because it undermines the principle of shared university governance. 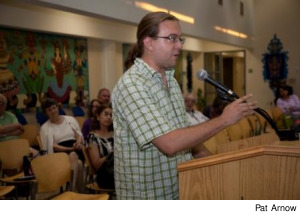 Read PSC President Barbara Bowen's statement and background on the issue. Now in its 36th year, the Union Women's Summer Schools are rooted in the traditions of early worker education, as exemplified by the Bryn Mawr summer schools for Women Workers of the 1920s and the WPA worker education programs of the 1930s. Courses of study are tailored to meet the needs and interests of women union members, activists and leaders. 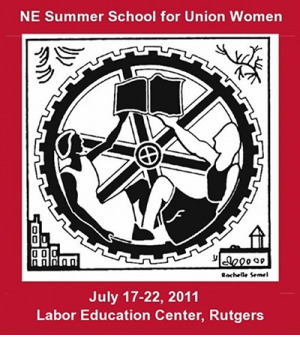 This year, Rutgers University will host the Northeast Regional Summer School for Union Women, July 17-22. PSC activists are encouraged to apply. The upcoming Metro New York Labor Communications Council Convention will be held Friday June 17 at the Murphy Institute. Barbara Bowen will join Democracy Now! host Amy Goodman and Fairness and Accuracy in Reporting (FAIR) Program Director Janine Jackson on a morning panel entitled “Framing the Public Sector” that begins at 10 am. Frances Fox Piven will be honored at 12:30 p.m. as Metro Labor’s 2011 Communicator of the Year and the conference will conclude with Metro’s labor communications awards ceremony at 1:30 pm. The PSC is receiving seven awards. (Click "read more" below for program and registration information). Save our schools! Make a call to stop Albany’s tax cap disaster! The New York Times called Albany’s property tax cap plan a "cheap political tool...that will only further devastate communities." NYSUT, PSC’s statewide affiliate, is fighting hard to block or significantly change the legislation, but the political situation is challenging and time is running out. We need every one of our members to pitch in to help get the job done. City Council Higher Education Chair Ydanis Rodriguez has called a rally/news conference for this Friday, June 3 at 11 am at the steps of City Hall. PSC Secretary Arthurine DeSola will speak at the event along with student activists and other council members. The news conference/rally will precede a public hearing at Emigrant Savings Bank (49-51 Chambers Street) where CUNY officials will testify about the impact of the Mayor’s Executive Budget. The public cannot offer testimony until Monday afternoon at 3:30 pm.